SKSPL (Shrikrupa Services Pvt. 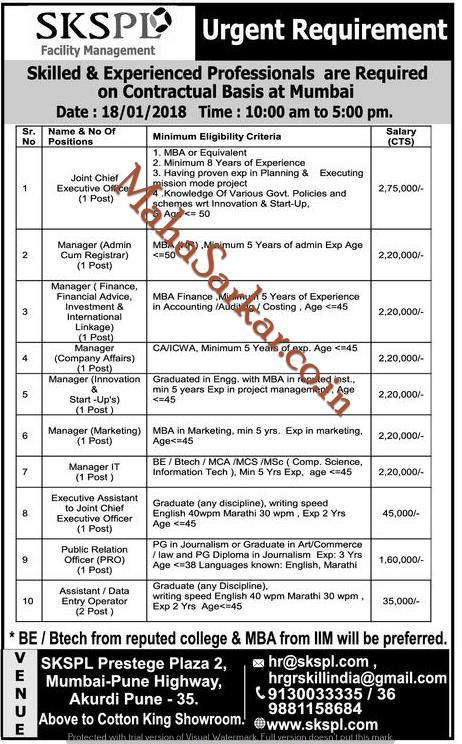 Ltd), Mumbai Published Job Notification for 11 Manager – Public Relation Officer & More Posts. Candidates who wish to apply must look at SKSPL Manager – Public Relation Officer & More Recruitment 2018. Eligible candidates can join Walk-in Interview on 18-01-2018. Education Qualification: MBA/CA/ICWA/Graduate in Engineering/BE/B.Tech/MCA/MCS/M.Sc/Any Graduate/PG and More. For Post wise Education Details follow the detailed advertisement. Age Limit: For Post wise age limitation Details follow the detailed advertisement. Interested & Eligible candidates may attend for walk in interview along with all the documents addressed at Shrikrupa Services Pvt. Ltd, Prestige Plaza-2, Office No.201/201 A, Opp.Formica(l)Ltd. Mumbai-Pune Road, Akurdi, Pune-411 035. Starting Date, Last Date to Apply offline at Shrikrupa Services Pvt. Ltd which candidates should be remember as follows. 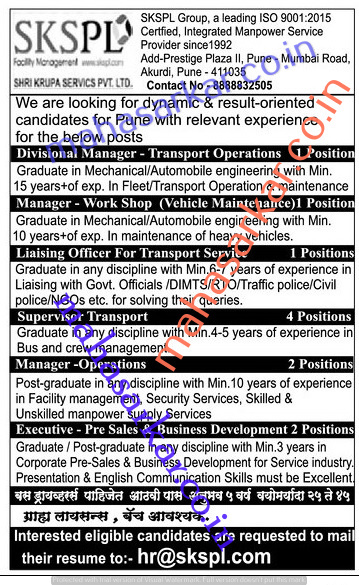 SKSPL (Shri Krupa Services Private Limited), pune Published Job Notification for 11 Operations Manager – Work Shop Manager & More Posts. Candidates who wish to apply must look at SKSPL Recruitment 2017. Eligible candidates can apply offline before August 2017. Education Qualification: Graduate/ Post Graduate and More. For Post wise Education Details follow the detailed advertisement. Interested & Eligible candidates can send their application along with all the necessary documents and testimonials Email to hr@skspl.com. Starting Date, Last Date to Apply offline at Shri Krupa Services Private Limited which candidates should be remember as follows. Last Date to Apply offline: August 2017.